There was an anti-German riot in Rhyl during the First World War. Many of us know about this, but in how much detail? It is a fascinating story. It starts with a piano tuner called Arthur Robert Brougham. Brougham was on the toll bridge over the Foryd on the early evening of Friday, May 21st, 1915. He was overheard talking about his objection to military service saying that, if he was compelled to become a soldier, he would fight with the Germans. He was also heard to say “it will not be long before Kinmel Park Camp will be blown up”. He then set off in the direction of Rhyl. The military patrol at the bridge were informed and the sergeant in charge of the piquet followed him and asked him for his name, address and nationality. Brougham refused to answer whereupon he was arrested and taken into custody at the Police Station. It was now about 7.45 p.m. Whilst in custody he was examined by Dr. A. Eyton Lloyd, J.P., Rhyl who certified that the prisoner was not insane but “peculiar”. A large crowd, comprised chiefly of South Wales soldiers, had followed the prisoner to the Police Station where they were shouting “fetch him out” and also threatening the prisoner, who they assumed was a German spy. They remained there until about 9.15 p.m when they got fed up of waiting and moved in the direction of Queen Street where they raided a shop at number 35 occupied by Robert Fassy, a hairdresser and tobacconist. Anti-German riots took place in Britain intermittently throughout WW1, especially after the luxury liner “The Lusitania” was torpedoed by the Germans off the coast of Ireland on May 7th, 1915 with the loss of 1,198 lives. photo courtesy of The Imperial War Museum. 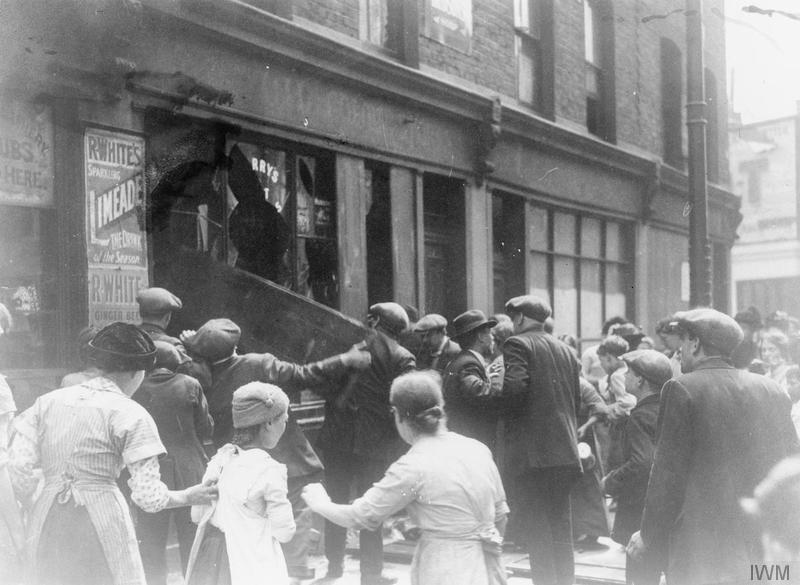 Photo shows anti-German riot in East London May 1915. Fassy had lived in Rhyl for about ten years in 1915 and was married to the daughter of a well known local tradesman Mr. Gunner, Boot Dealer. He applied for naturalisation on August 2nd, 1914, two days before Britain declared war on Germany. Papers completed during August show that Fassy, aged 28, described his nationality as Swiss and he stated that he had served in the Swiss Army for 13 weeks. However, in September he was interviewed by Flintshire Constabulary when he explained that his mother was Swiss, he was born in Heilbronn (Germany) and he was brought up and educated in Switzerland. Unfortunately he failed to declare in August that he had in fact served for one year in the German Army, which was necessary on account of his mother owning property in Germany. It’s not clear how this was discovered but official paperwork states that “some years ago plaintiff appeared at a dance in German uniform” and goes on to say “His true nationality was afterwards admitted and he registered as a German”. Fassy was interned at the Queensferry compound from 23rd October to 25th October 1914 after which he was released on bail, several Rhyl residents being sureties. He was still carrying on his business in Queen Street at the time of the riot. The crowd of soldiers, when they arrived at Fassy’s double fronted shop, broke the plate glass windows and went on to loot the shop taking tobacco, cigars, cigarette cases, tobacco pouches, walking sticks, hairbrushes, artificial wigs etc. Robert Fassy was on the premises at the time along with his wife Edith and two children, aged 2 years and 6 weeks respectively, who were ushered to the Police Station for their own safety, and the crowd followed. Rhyl Police Station, built 1885. The soldiers then raided the Police Station and broke 5 large panes of glass and damaged private property belonging to police officers. They tried to break into the Station but were prevented by the police and special constables, who were “roughly handled and assaulted by the soldiers”. Brig. 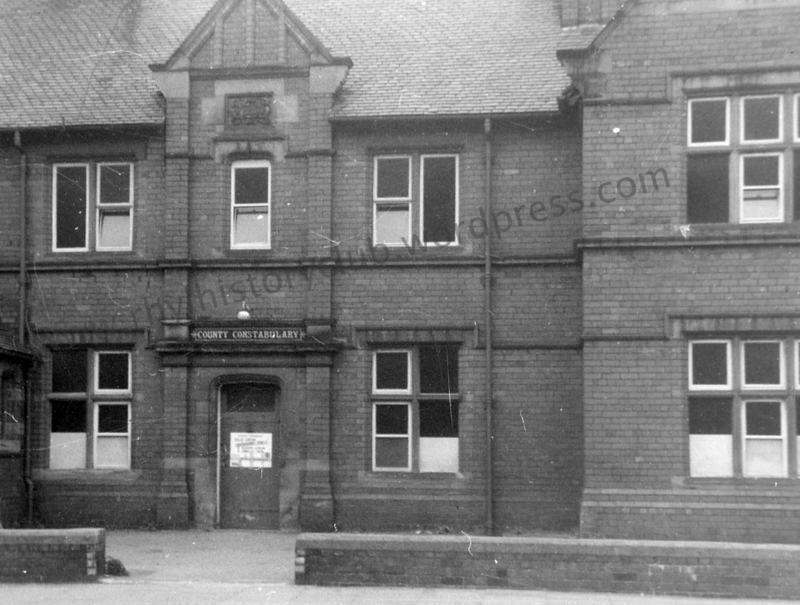 General R.H.Dunn*, commanding the 129th Infantry Brigade, Rhyl was informed of the events by telephone and he arrived at the Police Station at about 10.30pm. He spoke to the soldiers and ordered them to fall-in at Bodfor Street, after which they were marched to the promenade and then on to their billets. Robert Fassy, his wife and children went to stay with relatives in Victoria Avenue and on the Monday they left Rhyl for Birmingham. The Magistrates at Rhyl held a Special Meeting at the Town Hall at 4 p.m. on the Saturday. Brig.-General Dunn was present. Because a large number of the soldiers who took part in the raid were drunk, it was suggested to the Magistrates by the Chief Constable, that the licensed houses in Rhyl be shut by 6p.m. each day and all day Sunday. The license holders were duly informed that this was to take affect from the 22nd. Shortly afterwards a large number of soldiers gathered outside the Police Station and threatened violence if the licensed houses were not opened. There were no Military Piquets or Military Police near at the time. Brig.-General Dunn was informed and arrived at about 7 p.m., he spoke to the soldiers and also conferred with the Magistrate’s Clerk (Mr. F. J. Gamlin) and Mr S.Perks J.P. At 8 p.m. Brig.-General Dunn announced that on the authority of the Magistrates and himself, the licensed houses would be opened at once and remain open until 9 p.m. It was reported that “everything has gone smoothly since”. We’ll end the story where we began with Arthur Brougham. He was detained until 5 p.m. on the Saturday night and was ordered not to reside in the counties of Carnarvonshire (sic), Denbighshire or Flintshire. He was escorted to the Railway Station and left Rhyl on the 5.30 p.m. train for London.